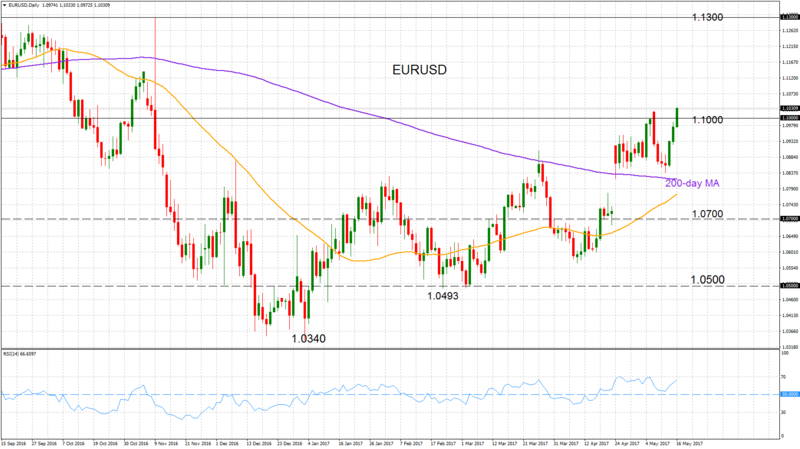 EURUSD has regained its near-term bullish momentum. The pair rose for a third day today, breaking above the key 1.1000 level. A daily close above this level would strengthen the medium-term bullish market structure that has been in place since the January 3 low of 1.0340. The market has been making higher highs and higher lows since the beginning of the year when it bounced off the 14-year low. EURUSD could be carving out another top above 1.1000. RSI is rising, which is supporting a bullish momentum in the market. There is scope for prices to target the 1.13000 area. But if RSI reaches overbought levels at 70, the market could correct lower. Support lies at 1.0820, which is where the 200-day moving average converges with the April 24 low. A breakdown of this support area could start to change the medium-term bias from bullish to neutral. From here, prices could accelerate a decline and see a deeper correction towards 1.0700. Additional support lies at the 1.0500 level before prices would target the 14-year low of 1.0340.